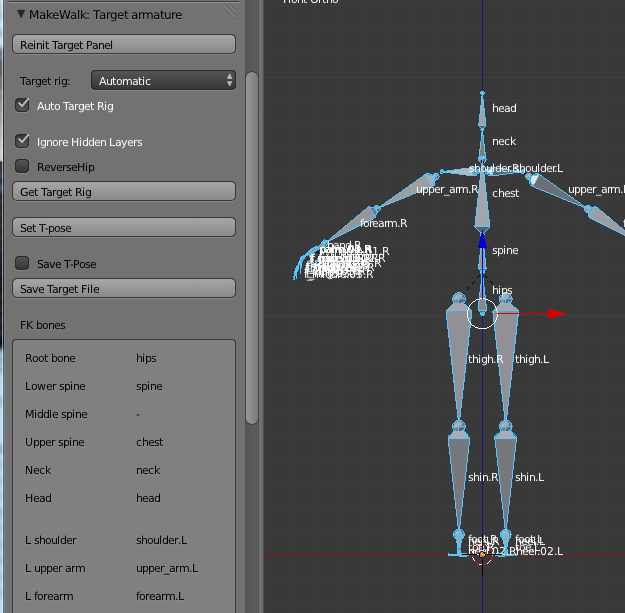 The second part of the mapping from source to target armatures is defined by the panel labelled MH Mocap: Target armature. It is the top-most of the mocap tool panels, and is closed by default. Target rig. A list of bvh rigs recognized by the mocap tool. This either defines the expected Target rig (if Auto Target rig guessing is disabled), or is set to a matching rig (if automatic target rig identificiation is enabled). MHX. An advanced rig from MakeHuman alpha 8. MH Alpha 7. The MHX rig from MakeHuman alpha 7. Ignore Hidden Layers: Ignore bones on hidden layers during automatic rig identification. Reverse Hip. Select this option if the armature has an reverse hip. It is rather common that an armature has a reverse hip. In a normal hip setup, the armature root is the hip or pelvis bone, and the thighs and the rest of the spine are children of this bone. In a reverse hip setup, the first bone in the spine has been reversed. There is a separate root bone, and the two lowest bones in the spine are both children of thise root, whereas the thighs are children of the reversed hip. Identify Target Rig: Identify the target rig, i.e. find out how bone names in the active armature correspond to the internal names. This step is performed automatically during retargeting, but the identification can also be done separately for debugging purposes. The bone map appears in the area called FK bones below. Set T-pose. Pose the active armature in T-pose. Save T-pose. Option used by the next button. Save Target File. Save the current bone map as a .trg file. If the Save T-pose option is set, also save a json file defining the T-pose. FK bones. The bone map. The picture below shows automatic rig identification of the Rigify meta-rig (Add > Armature > Advanced Human).